Halfway through Shin'ichirô Ueda’s One Cut of the Dead, I have to admit I wasn’t entirely feeling it. The film opens in an abandoned warehouse, where a low-budget film crew is shooting a zombie feature. A young woman (Yuzuki Akiyama) cowers in the corner as her former lover (Nagaya Kazuaki), now zombified, lurches towards her. She screams, but not realistically enough for the film’s director Higurashi (Takayuki Hamatsu), who yells cut and then angrily berates her for the lack of genuine fear in her performance. It’s the 42nd take, and everyone is exhausted. The director storms out, giving the actors the chance to sit and have an awkward conversation with the film’s makeup artist Nao (Syuhama Harumi), who reveals that this building was the site of some genetic human experimentation once upon a time. You know where this is going. The chief selling point for One Cut of the Dead is that the first half of the movie unfolds in a single unbroken take. It’s a filmmaking gambit than can be exciting and propulsive, but one that can just as easily come off as laboured, awkward and forced. One Cut of the Dead falls into both camps. It’s hard not to be charmed by the sense of ambition and the scrappy energy on display here, as Ueda’s cameraman races up and down stairs, chasing the film’s central characters who are in turn fleeing the lumbering undead. But then a spray of blood hits the camera prompting a hand to enter the frame and wipe it off, and Higurashi turned to the cameraman and ordered him to keep shooting, making me wonder whether this cameraman was supposed to be an additional character in the drama. Whose perspective are we seeing this film from? There’s also the rather slapdash quality of the filmmaking to get used to. One Cut of the Dead is obviously a low-budget venture, but the amateurish nature of its technique kept getting in the way of the fun that I felt I should be having with the movie. At one point, the camera is dropped to the floor and it just lays there on its side for what feels like a minute until it is picked up and the action can resume; later, the shot is held on Akiyama as she screams for a ridiculous amount of time, obviously while some bloody prosthetics are being prepared behind the camera. It’s funny, for a while, but it’s also a little vexing. As much as I admired the energy, creativity and audacity of the whole enterprise, I kept wondering why it had to be presented this way. When the credits finally rolled around forty minutes into the movie, I felt a little relieved, but also curious. Okay Ueda, I thought, what else have you got? I can’t remember the last time a film confounded my expectations and won me over so comprehensively in its second half. After its credits sequence, One Cut of the Dead restarts one month prior to the events we’ve just witnessed. A struggling filmmaker who describes himself as “Fast, cheap but average,” Higurashi is hired to shoot a live TV stunt for a new Japanese horror channel, with their attention-grabbing idea being a zombie movie shot in a single take. Ueda’s filmmaking is more conventional now, but it's also more entertaining and more involving. He introduces us to the various characters who will play a part in this production and sets up some running gags – one character’s alcoholism, another’s chronic diarrhoea – and subplots that will pay off later. The performances are all on point and the comic timing is sharp, with Ueda developing and shifting our perception of these characters, before taking us back to that warehouse, where Higurashi is about to call “Action!” on his ambitious and possibly insane long shot. The climax of One Cut of the Dead runs through that opening forty minutes again, this time deconstructing it from behind the scenes, and it reveals that all of the awkwardness and clumsiness that aggravated me in the first half was a feature, not a bug. 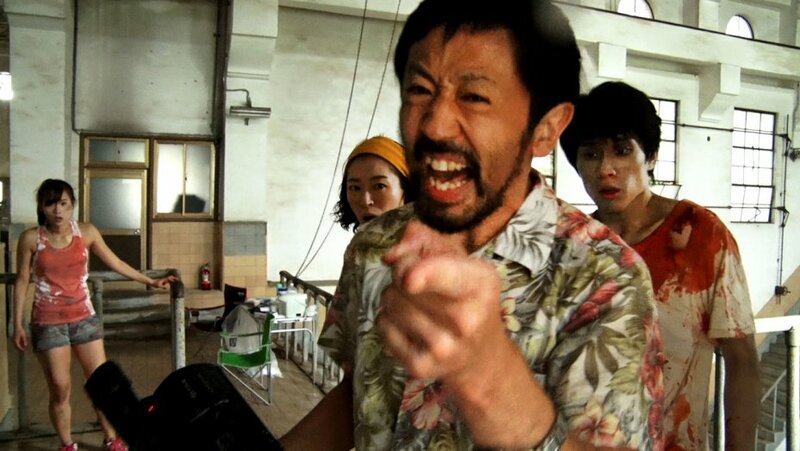 One Cut of the Dead presents itself as a shambolic amateur production, but Ueda is in complete control of his film. It’s as brilliantly constructed a comedy as I can recall seeing, and it’s also hysterically funny, generating an exhilarating, ever-escalating momentum as this rag-tag cast and crew desperately try to keep their film on track under the most chaotic circumstances. As Higurashi and his team clambered on each others' shoulders to pull off the film's ending, I found myself getting a little choked up; the sight of these endearing characters pulling together to achieve their near-impossible goal gives the film a triumphant and hugely satisfying climax. It seems the contrived clumsiness of the film's first half isn't One Cut of the Dead's only bait-and-switch. The film is being sold as a wild zombie comedy, but it ultimately reveals itself to be one of the great films about filmmaking; a savvy, sweet and profound celebration of the the ingenuity and teamwork required to bring a low-budget feature to life against the odds.